Father's Day was a failure for me this year all due to my lack of effort. I will tell you the truth, after Paul's birthday and N's birthday rolls around, I've got little energy for Father's Day. I start out pretty good with good ideas for gifts for Paul and great ideas for parties for N and then by mid June it's all gone. I should probably store up ideas for gifts for poor Paul, but I'll tell you the truth, he's buys a lot of what he wants and the experiences he'd like (such as sailing lessons or cooking lessons or woodworking lessons) don't come cheap. After a bit, I hate getting him the same thing year after year ("more cooking goodies!!") and feeling lame. Next year, I'd really like to try to do something a little more special for his birthday, at least. The present I was saving for still seems like a workable gift. Yes, it's a very late gift, but it's not cheap and I was unprepared to get it for him. I was excited about it, but recent talks with him leave me a little unsure. Hopefully it all works out for the best when he eventually gets it. So, what did we do on Father's Day? We visited my mom overnight. While this seems strange, it allows me and Paul to go out the night before and for Paul to sleep in the day of, so it really was a present for Paul too! We saw Toy Story 3 which was great, but not as great as Toy Story 2 . If you're a fan of Pixar films, or a fan of the first two Toy Stories, or both, get yourself out there if you haven't already and see it. It really felt like a nice ending to the series. If you're a sobber like me, make sure you bring some tissues with you. 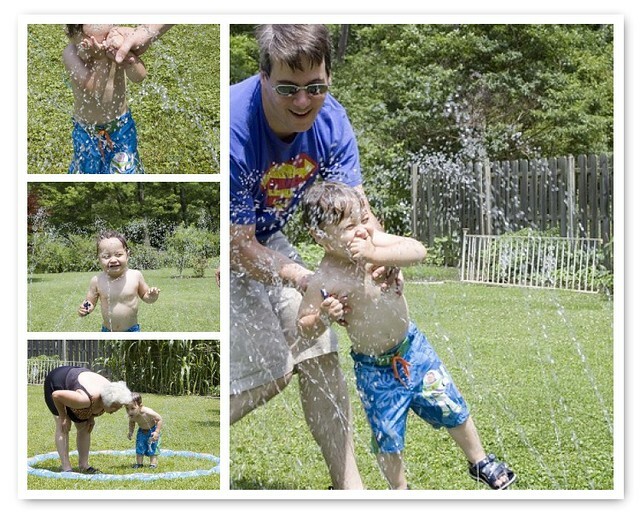 The day of Father's Day, we slept in while my mom played with N, went to brunch, and watched N splash in his new sprinkler toy. While N definitely had more fun, I'd like to think both father and son enjoyed themselves. After that, it was a glorious nap for everyone, and after we awoke, a trip to Paul's father's to say Happy Father's Day! N managed to snag some of the corn they had for dinner, but mostly didn't eat. It's like he knew I was making tacos later in the evening! That's right, folks. I made dinner! I know. It was a momentous occasion full of celebration. Sure, it was just tacos and refried beans, and nothing was really from scratch, but I think we all managed to stuff ourselves and enjoy it. I know Paul reads this blog, so I'll end this with a picture and some information for him. Sweetie, this baby would like to mow a lawn with you, probably right now. If he's awake, he's probably discussing it with me too. We'll miss you when you go to work for a few weeks.